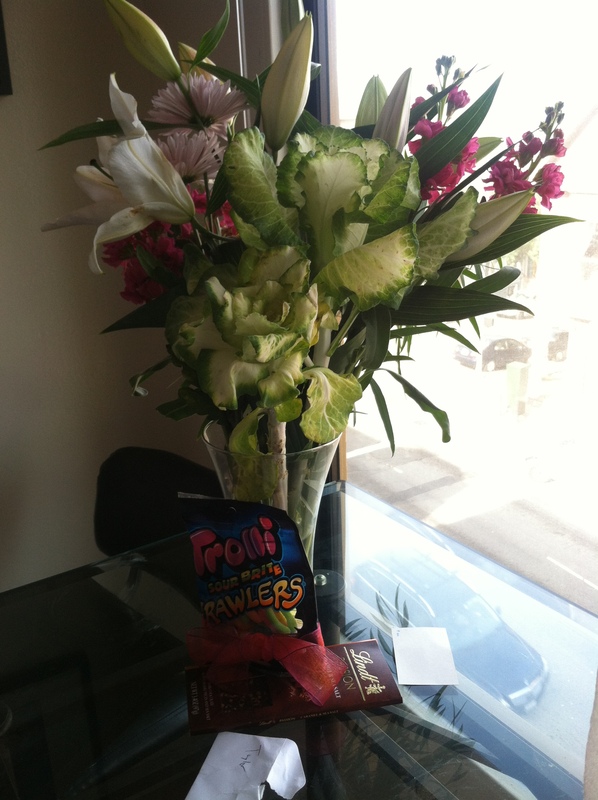 Flowers, sour candy, and chocolate: be still my heart. After incredibly long weeks of work for the both of us and a bout with a nasty cold/mild flu for me, I am very excited for a healthy weekend. I woke up this morning feeling better than I have in days and returned to the gym this morning for a spin and lift. Last week’s workouts went so well, and I think I made the right decision to rest and get better quickly rather than push through the sickness with the probable result of prolonging the symptoms. Jesse and I are off to Houston for a wedding: one of Jesse’s childhood friends is getting hitched in his fiance’s native Lone Star State. We’ll be sure to report our running adventures pre-ceremony (we’ve scoped a few parks for running trails) and whether Texans eat anything other than steak. Have a great weekend and Valentine’s Day, yeehaw! So sweet, the flowers are beautiful! Happy belated Valentine’s Day, guys!